Its true! 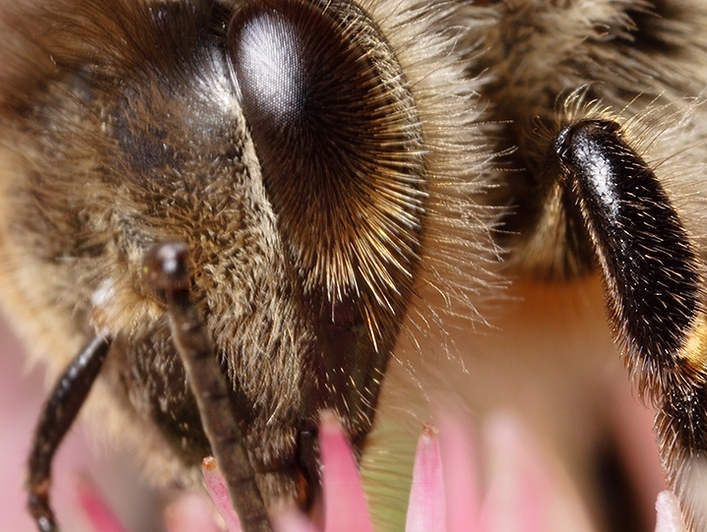 Bees have hairy eyeballs. "Why?" you may ask. The hair grows in the intersections of the compound lenses of the eye and are believed to serve as a kind of navigation system allowing the bee to triangulate its position relative to the sun and find its way home. Proof again, that Mother Nature has a very good imagination! The type and age of the flower from which the bees collect nectar and other variables affect the exact composition of the honey as well as its colors and aromas, creating the delicious varietals of artisanal honeys that experienced beekeepers harvest. Bees pollinate over half of the food we eat. Without them our food supplies would diminish so quickly that humans could not survive on the planet for more than 4-5 years. Wing It. Worker bees use their wings to fan the nectar inside their hive to reach a moisture content of 18% –– a process that ripens the nectar into honey. Ciao Bee! The most common type of honeybee in the US is the Italian honeybee. They became popular because they were very good producers and resistant to most bee diseases. The legendary beauty of Cleopatra is so renowned that her natural beauty rituals are sought after by women who want to look just as attractive and desirable as she was. Honey was integral to her beauty routine. She used royal jelly on her skin for a youthful glow, beeswax to moisten her lips and honey to wash with. Bees date back to the dinosaur days and haven’t changed much since. With a track record like that, it’s important for us to care for and take cues these little survivalists.